Ask a crony back in the hood, "What does it mean to stretch forties with friends?" A few creative minds may reply it means to quaff forty-ounce bottles of icy gold gusto with your homies. You should not get many other answers though, since hardly anyone knows, "What is a stretch forty?" 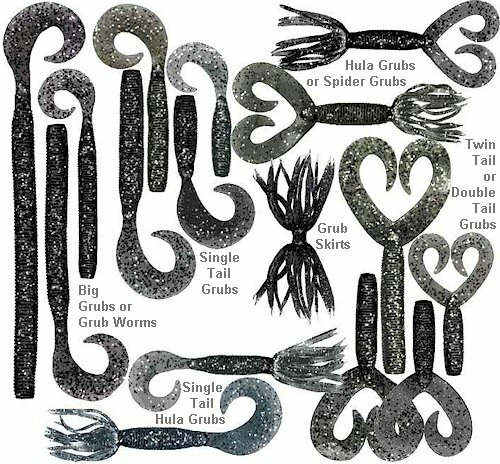 The Stretch 40 is Yamamoto's 2-series single tail grub. It's not very popular. It's relatively unknown. Yamamoto's 40-series and 18-series single tails are many times more popular and better-known among anglers. Yet the few standouts who steadfastly favor the Stretch 40 say it is an awesome bass catcher - a better mousetrap than the 40 or 18. I'm inclined to agree with them. 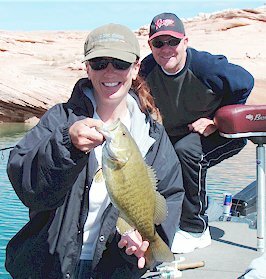 Although it is hardly known by anglers outside the desert Southwest, the Stretch 40 has a handful of ardent users who quietly win tournaments with it in that region. Husband and wife tournament anglers Murph and Mel McBride from Nevada are a team who definitely know what a Stretch 40 is - and precisely how to use it. Less Tail to Attack. Fish have a penchant for picking grubs up by the thin tail. With only the thin tail being held, you rip it off trying to set the hook. The 18-series has much more tail - at times too much. Some guys figure they'll shorten the 18 body part, but that typically doesn't help too much since the 18 tail still stays as long as ever. No matter how tiny you make the 18 body part, they're still wanting to pick it up by the tail, okay? So the trick is not to make the body shorter, but make the tail shorter - about as short as the tail on a Stretch 40! More Body to Rig. The Stretch 40 body is more than long enough to match any jig hook size or jig skirt length. In fact, Steve Batty usually pinches a piece off the body to better match the jig size. Always pinch your fingers down on the short piece you intend to discard. This short piece will become mushed and misshapen from the pressure exerted by your fingertips. However, the part you intend to lace on your hook will be left in perfect shape. It is important to hit the mold seam line where you poke the hook out, and the circle-shaped tail should always point down on a jig. If you're an astute reader of Bassmaster magazine, you may have noticed a tip from Mike Iaconelli in a past issue. Story goes something like Ike may have observed a preponderance of bait-sized warmouth sunfish and asked his sponsor, Mann's Bait Company to custom-make green and orange-patterned baits for Ike to use in the Bassmasters Classic that he won, if I recall correctly. A friend, Yamamoto sales supervisor, Jeremy Riley independently concocted a similar jig color pattern several years ago. Let me now say this, "I've got many friends and every one has his or her killer color-to-die-for. Most have not impressed me yet." I shared my skepticism so I can say, "This color Jeremy assembled is the bomb!" No lie. It's a few years back that he first tried it - and I have used it ever since. It's become a year-round jig color for me. I've even adapted this jig color pattern to my crankbaits, jerkbaits and spinnerbaits. It's a brown and orange rubber skirted jig with a 194 (watermelon pepper) Stretch 40 trailer. At first, I assumed it was a craw pattern jig that Jeremy put together. This thinking just goes along with the herd mentality since most people think of jigs as crawdad imitators. They use jigs in a crawdad crawl or hop in crawdad colors. In the fullness of time, as I used it more and more, I realized this color imitates a warmouth - a thick-bodied, large-mouthed sunfish that ranges from Wisconsin to south Texas, and from the east coast of the USA through west Texas at least. It's a thick-bodied, bulky sunfish with dark olive to brown coloration on back and sides covered with mottled dark spots and bars on back that can take on a purplish hue. Vibrant reddish and neon blue color streaks across the face cheeks and gill cover. The belly and bottom fins are often brightly colored - chartreuse, yellow, bright orange. A brown, orange and green color pattern imitates it. Steve Batty gave me the trailer to use, Jeremy Riley the color. The flipping jigs were hand-tied for me by amigo Brian "Stick" Nixon of Pepper Jigs. Buddy Tom Monsoor was the spark who inspired me to swim rather than bounce, crawl or hop jigs on bottom. FLW pro Monsoor's fame is in swimming say a 1/4 oz finesse jig. Yet I've applied Tom's swimming system to much heavier models of sturdy flipping and football jigs up to 1 oz. Many persons ask, how do you swim it? Monsoor himself hasn't said much. A bunch of armchair experts eagerly reply, you swim it just like it's a spinnerbait - except it's a jig! I don't think so. To me, I maneuver my swimming jig more like a crankbait. The same manner and speed of retrieve, fairly fast. Just like a crankbait, I find a high percentage of hits as the swimming jig stutters over high spots on the bottom. Also like using different size cranks to reach different depths, I deploy different size jigs to reach different depths. A 3/8 oz Pepper Jig swims in less than five feet, a 1/2 oz Pepper jig swims from zero to ten feet. I switch to a 3/4 oz football jig for zero to twenty-five feet. A 1 oz football jig can be swum from zero to forty feet on a single retrieve. These may sound like heavy jigs to you, but they ring the dinner bell swimming past a bass. Pressed against each other in the bag during storage, the feather-thin tails of Stretch 40s get folded over and bent out of shape. You will catch fewer bass with badly bent tails. You will catch more bass by picking out the least-bent tails in the bag. You can help return tails back to their original shape by annointing Stretch 40s in an attractant like MegaStrike. Marinating tends to relax baits and helps ease them back to their original properly molded-in tail alignment. With a rejuvenating attractant, Stretch 40s want to go back to the shape they were cured and solidified in the mold. They get more supple, limber up, the kinks come out, they spring back into shape. Exposing the bag to warm sun also aids this process. On a hot, bright day with MegaStrike in the bag, you can notice the wrinkles coming out of your Stretch 40 tails within the hour. One may wonder why should fish care, but in my experience, there is nothing like a correctly straight grub tail to generate maximum bites. In a pinch, plain lake water can be used to help soften and straighten baits back toward their original molded alignment and makes them slick and slimy just putting some lake water in the bag of Stretch 40s you plan to use in the morning. However, an attractant like MegaStrike gets absorbed into the bait's surface. They get more of a slick slimy feel than is possible with mere water. They take on a living sheen coat. Especially the translucent colors become even more translucent and capture light better when glistening in attractant. If a fish bites the tail off a Stretch 40 that's been marinating in an attractant like MegaStrike, you can expect that bass may immediately hit again on that same cast in order to get the rest of the bait that lost its tail. However, to cast that bait in a second time without the grub tail tends to be futile. One may wonder why should fish care if there's no tail. Doesn't a tail-less Stretch 40 looks like a Senko? Yet in my experience, I don't catch many bass once a Stretch 40 is de-tailed - except on the same retrieve by the same bass that took off the tail. There's nothing special I can see about the Stretch 40 except that a few of my friends are terribly fond of it and so are some bass. I particularly like to fish it on an open hook Stand Up Jig model made by friend Joe Rummelt of Laketown Jigs. I tend to keep an open hook jig moving more quickly than a fiberguard jig. I use a stiff rod and whenever the Stand Up jig hits bottom debris, I'll instantly snap the rod tip to jig it up and over the debris, which can be rocks, weeds, brush or wood. As the jig recovers its composure from being shocked over the debris, I'll get a reaction bite right then. I call this snap-jigging. It's cool. I use the open hook Stand Up Jig to do it. The Stretch 40 is usually reliable for me fished in these ways, thanks to my friends.